Trail 50 – RAF Wratting Common – One of the best records of No. 3 Group. In this next Trail, the 50th trail around Britain’s Wartime airfields, we continue looking at Bomber Command’s airfields around the Cambridge / Suffolk borders. Being a bomber base, this is another that operated both the ill-fated Stirling, and then later the famous Lancaster; it is also a base that had some of the best survival records of 3 Group, but it also paid the price that came with the Stirling. Turning north-west from Haverhill toward the metropolis of Cambridge, we visit an airfield that is on one of the highest points in the eastern region, at just below 400 feet above sea level, it was cold and inhospitable in winter, but it was one whose pride and significant contribution shall live on. Here we visit the former Bomber Command base RAF Wratting Common. Wratting Common airfield opened in the latter part of the war, May 1943. It was initially named after the local village, West Wickham, which lies a couple of miles to the west. However, due to confusion with another airfield, it was renamed in the August, becoming known as Wratting Common, the name it retained, and used, for the remainder of the war. Operating under No. 3 Group the losses from Wratting Common would be high, 260 personnel would lose their lives here, equating to almost eleven every month for the duration of its short two-year life. Many of these crews would be Short Stirling crews, the enormous bomber that would take an incredible amount of punishment, but suffered with a limited service ceiling and a weak undercarriage that led to numerous accidents whilst landing or taking off. Wratting Common was opened in May 1943, under the Class A specification. Three concrete and wood chip runways were built to 2,000 yards and 1,400 yards respectively. A perimeter track joined the three runways and housed 36 spectacle hardstands for aircraft dispersal. Repairs were carried out in one of five hangars, four T2s and one B1, mainly located to the north and west of the airfield. To the south lay the bomb store, and the site had the usual range of standard design buildings. The watch office was of the 12279/41 design, a design adopted by all major airfields by the end of 1943. 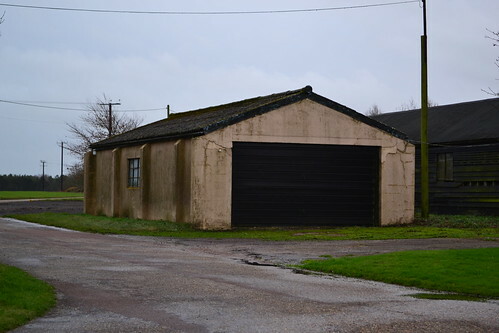 The only B1 hangar built at Wratting Common still survives today. Designed to take just over 2,000 males and 348 female staff, it had 10 domestic sites spread about the northern side, these would receive in the region of 2,500 males of various ranks and 486 females, numbers fluctuating as crews invariably failed to return home and units came and went. As it was a short-lived airfield, it would have only two operational front line squadrons, No. 90 and No. 195, although other units did use the airfield including: No. 24 Heavy Glider Maintenance Section, No. 273 Maintenance Unit, No. 1552 Radio Aids Training (RAT) Flight (No 2 Section) and No. 1651 Heavy Conversion Unit (HCU). The opening of the airfield was preceded by the arrival of S/Ldr. W. K. Young , who took early control of the site and oversaw the final preparations for the forthcoming crews. Between April and May, construction was completed, defences were set up, and by the end of May the first operational aircraft began arriving. A handover saw a new and permanent Station Commander take over, a change that saw operational sorties begin within a matter of days. No 90 Sqn, a first World War squadron, had been absorbed by 17 OTU in 1940, and then reformed again in May 1941. 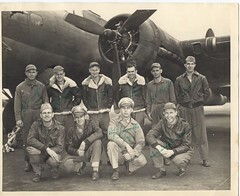 They served for almost a year being the only RAF unit at that time to fly the B-17 before being disbanded once more. This pattern of reforming and disbanding was one that 90 Sqn would perform almost perpetually. During these five months 90 Sqn would lose 185 aircrew, a figure testament to the problems with the Stirling but also to the dedication of the crews to ‘get the job done’. The first sortie took place on the night of 3rd/4th June 1943, when ten aircraft carried out a mine-laying mission off the Biscay ports. A rather uneventful mission, it would be one of the few where all aircraft returned safely. With Bomber Command’s Battle of the Ruhr approaching its final chapter, 90 Sqn would suffer their first casualties on the night of June 21st/22nd, 1943. It was a mission to Krefield, a mission that saw 705 aircraft drop 2,306 tons of bombs on the town destroying almost half of it. It was the largest area of devastation so far of any mission and was preceded by an almost perfect marking from the RAF’s Pathfinders. 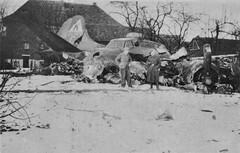 The night was marred by high losses though, just over 6% of the force being lost, many as a result of night-fighter action. Of these, 90 Sqn got off lightly losing only one aircraft, Stirling MK.III ‘WP-T’ with the loss of all seven crewmen, a crew that included both an Australian and a Canadian airman. 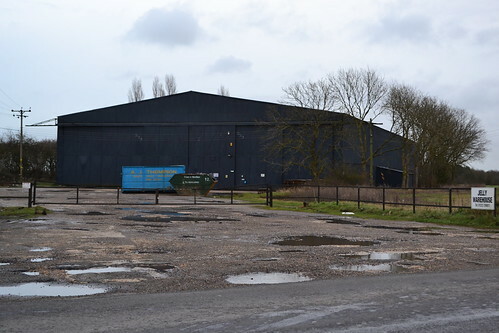 One of the remaining five T2 Hangars still in use at Wratting Common. By the 26th, just four days later, another five aircraft had been lost with only four survivors; a hefty blow that took the lives of thirty-one airmen whilst in their prime. A new month proved little better, on the night of 3rd/4th July, three more aircraft would be lost, one ‘WP-F’ returning beaten up overshot the runway without thankfully, loss of life. The remaining two aircraft were lost over Belgium and Germany, with only one crewman surviving, captured by ground forces and surviving as a POW. July would see a both further losses and 90 Sqn returning to Hamburg no less than three times before the month was over. Bomber Command’s tactic of area bombing would now turn from the industrial heartland to the city of Hamburg, and its enormous ship building works. Hamburg would of course become well-known for a number of reasons, the destructive firestorms that would devastate the town, the first joint efforts of the USAAF and RAF, and the use of ‘Window‘ for the first time. Surprisingly during these raids, 90 squadron would have a rather uniquely ‘clean bill of health’, especially considering the nature of the target. Hamburg would not be easy, attacking at heights of around 13 – 16,000 feet, they would be dropping a mix of high explosive and incendiary bombs, well below the height of other squadrons. On the first night 24th/25th July, all 90 squadron aircraft would return to base, a night that was followed by the loss of one aircraft (Stirling ‘WP-S’) to Essen, before they returned to Hamburg on the 27th/28th. The loss of this Stirling ‘S-Sugar’ was significant in that it was piloted by the Squadron Leader, S/L. Joseph Dugdale DFC, (s/n 39071). Presumed lost over the sea, the aircraft also had two New Zealanders and an Australian on board, one of which was washed up on the Norfolk coast along with two other members of the crew. After attacking Hamburg, and damaged by flak, Stirling BK693 ‘WP-A’ would limp back to England landing at nearby RAF Stradishall, where it swung off the runway hitting another Stirling parked at a dispersal. The only 90 Sqn loss that night, it would set a precedent for the third and final attack of the month. Returning the next night, 777 aircraft would fly in from the north of the city, attacking areas so far not damaged by allied bombing. 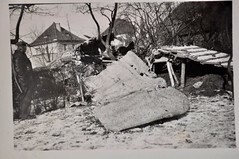 This raid would not be considered one of the RAF’s most ‘successful’ though, the bombing ‘creeping back’ some four miles into residential areas with huge loss of civilian life. Of the 119 Stirlings sent out that night, only four were lost, the only casualty of 90 squadron being ‘WP-F’ which took off at 22:00 hrs, crashing out of control without loss just after. These light casualties, gave 90 Sqn one of the best records of No. 3 Group, a record that continued to the end of July and the closure of the Battle of the Ruhr. At the end of July, Wratting Common was visited by an American airman. In rather less than ideal circumstances, Major William Julian of the 83rd FS, 78th FG, based at Duxford, made a wheels up landing in his battle damaged P-47 #41-6628, ‘HL-R’. The aircraft would eventually be recovered and repaired only to suffer a similar fate later on. July had been a busy month at Wratting Common! August 1943 brought the change of name to the airfield, but no change in operations. Missions included Nuremberg, another return to Hamburg, Turin (famous for the VC awarded to Flt. Sgt. Arthur Aaron), and now for the first time, the rocket research establishment at Peenemunde. It was also a time when Sir Arthur Harris turned his attention to Berlin, the heart of the German Reich. A city heavily defended and a long way into occupied Europe, it was going to be difficult for Bomber Crews, and 90 Squadron’s run of luck could be about to falter. During the short period of late August and early September 1943, 1,600 sorties would be flown to Berlin, and if the German’s determination to survive was going to be seen anywhere, it was going to be in their fearless defence of the capital. On the first night of August 23rd/24th 1943, two 90 Squadron aircraft were lost, one ditching in the sea just off the coast near Cuxhaven north-west of Hamburg. After spending 7 days, 16 hours and 10 minutes in their dingy, three of the crew were rescued, the remaining four having been killed*1. A second Stirling, EH937 ‘WP-S’ was also lost that night. Piloted by Flt. Sgt. Kenneth Longmore, (s/n 413622) an Australian and hairdresser by trade, it crashed in the Ilsselmeer, a stretch of water north of Amsterdam. The aircraft, along with all its crew, were lost at 20:37, three being killed and four classified as ‘missing’. The path to Berlin was lit by Pathfinders, and of the 727 aircraft sent, 124 were Stirlings, the loss rate for the mission being just short of 8% in total. 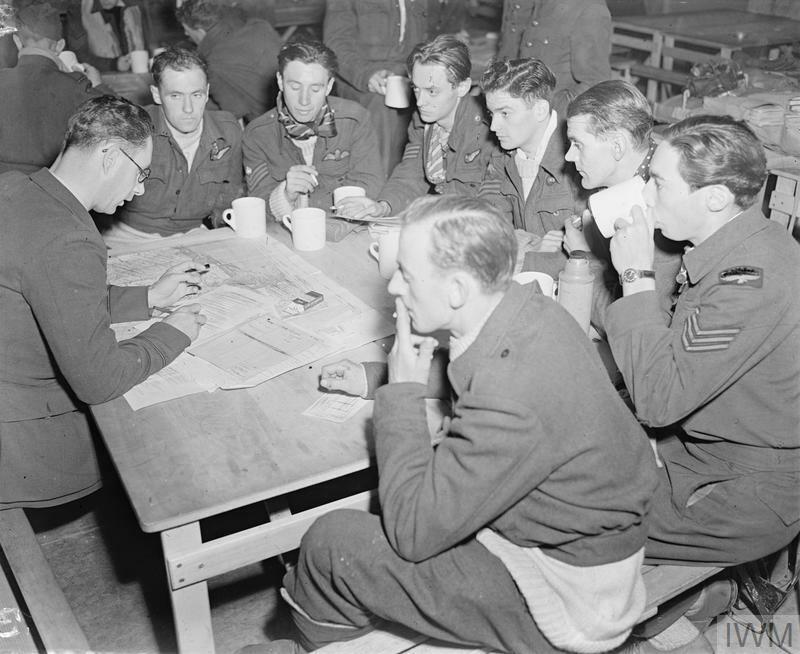 The crew of a Stirling are debriefed by an intelligence officer after the costly night raid on Berlin, 23/24 August 1943. © IWM (CH 10804) Can you identify any of these men? A further loss of a single aircraft on the night of 27th/28th August led to a return to Berlin, and another night of heavy losses for Bomber Command. The Stirling loss rate alone being 16% of the force. Luckily 90 Squadron themselves came off ‘lightly’ once more, losing only one aircraft that night, Stirling MK. III ‘WP-Q’ piloted by W/O. Martin P. Callaway RAFVR, (s/n: 155479), who was only 20 years old. A third raid to Berlin, saw the withdrawal of both Stirlings and Halifaxes from these duties, their losses being too high compared to those of the Lancaster. The Germans now employing a range of tactics to illuminate the night sky, allowing the night fighters to pick the bombers off almost at will. There then followed a period of relative calm, until at the end of September, when on the night of 22nd/23rd, 90 Sqn returned to Hannover. A raid that would perhaps be recorded as one of their worst. Between 18:50 and 18:54, three aircraft would depart Wratting Common, one ‘WP-K’ would not get far, its starboard engine catching fire shortly after take off causing the laden bomber to explode at a height of 500 feet. All but one of the crew were killed instantly, whilst the seventh, F/S. Duffy, later died from his injuries. Of the remaining two aircraft, one was brought down by night fighters over the target, with the loss of all on board, and the third, badly beaten, limped backed to England crashing at RAF Lakenheath in Suffolk. Two crewmen survived as prisoners, parachuting from the aircraft after confusion arose when the pilot lost control of the Stirling – the remainder of the crew being either killed or injured. For airmanship and courage Sgt. Jones was awarded the Conspicuous Gallantry Medal whilst W/O Denton was awarded a DFC, and Sgt. Suddens a DFM. By October 1943 the Stirling’s days were numbered, and orders had come through for 90 Sqn to depart Wratting Common for RAF Tuddenham. Crews began to pack and aircraft were readied for their eventual departure. On the 12th a final air test would be carried out on Stirling EP426 ‘WP-W’ and it would not go well. A full crew watched aboard as the pilot W/O. George R. Hilton(s/n: 158247) RAFVR tried to land the aircraft with the starboard outer engine feathered. The landing was a disaster and the resultant crash killed all but one of the crew, Sgt. J. Moran the rear gunner being injured. With that 90 Sqn departed Wratting Common taking with it a record that was one to be proud of, but as part of Bomber Commands overall strategy, it certainly had paid a high price. For around six weeks the airfield was, flying wise, very quiet, final departures and preparations for new arrivals were made. At the end of November a new unit would arrive, bringing back the mighty Stirling to this open and cold station once again. Nissen huts once used by technical staff are now part of the farm complex. 1651 Heavy Conversion Unit (HCU) were one of three such units still operating the Stirling, the remainder having switched to Lancasters or Halifaxes previously. Whilst at Wratting Common, 1651 HCU would convert crews to four engined heavies, a task much-needed as the toll of recent attacks on the German heartland was beginning to bite. Now withdrawn from front line bombing duties, Stirling crews were feeling a little pushed out, often left by the crews of Lancasters and Halifaxes who rose to the higher levels to avoid the fighters and flak. The conversion to Lancasters by Bomber Command was long and slow, the poor winter of 1943/44 playing a large part in its delay, restricting flying hours and crew training. Once ‘passed’ on Stirlings, crews would go to Lancaster finishing Schools, honing their skills on a much more adored aircraft. The HCU would remain here for a year, suffering its own share of problems and accidents. Within the first week one Stirling would crash just 20 minutes after take off whilst on an emergency approach to nearby RAF Downham Market. 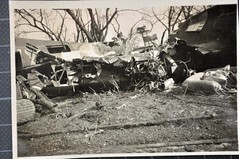 After losing power the aircraft spun violently crashing into the ground. Thankfully and very remarkably, all the crew escaped with minor injuries. In June 1944, the renowned undercarriage of the Stirling would lead to problems for the ground crews of Wratting Common. On the night of 6th June, Stirling BF473 landed on the runway at Wratting Common whereupon its port tyre burst. On departing the aircraft, leaving it to the ground crews to recover, the crew left and headed back for their debriefing. Just a few minutes behind them though, was Wellington JA619 of 69 Squadron at RAF Northolt. Suffering engine trouble, the Wellington made an emergency approach unaware of the huge obstacle that lay ahead. 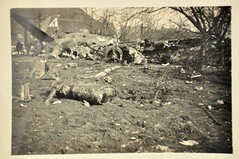 The two aircraft collided, creating a huge fireball that took both RAF and local fire crews several hours to extinguish. In the incident, two of the Wellington crew received injuries and a further two were killed, their bodies were not recovered until the next morning after the fire had been put out. Further training and minor accidents continued, July 1944, saw one major loss with the crash of Stirling MK.III LK565 ‘QQ-R’. Whilst banking, the pilot F/S. DH Wilson lost control of the aircraft causing it to crash killing all eight on board; the eighth man being an additional navigator. The year progressed and more crews were turned out. Spares for the Stirling became scarce and eventually the HCU was itself to convert to the Lancaster, the Stirlings later being disposed off. With that, 1651 HCU pulled out of Wratting Common leaving only a front line Lancaster Squadron, who arrived eight days previously, the only operational unit using Wratting Common. 195 Sqn, previously a Typhoon Squadron, had reformed at Witchford from ‘C’ flight of 115 Squadron. Flying the Lancaster MK.I and III, it arrived at Wratting Common on November 13th 1944, staying until August 1945 where upon it was disbanded. By now the RAF bomber crews had all but total control of the skies, carrying out a number of raids in daylight such was the state of the German defences. With attacks on Merseburg, Dortmund, Oberhausen and Hamm, losses were low, around 1%, considerably lower than figures previously seen. The high morale of bomber command was about to take a battering though, in the daylight raid on the 12th December 1944 on Witten, a town that had seen extreme violence on the night of Kristallnacht of 9th/10th November 1938. During the raid a force of 140 Lancasters from 3 Group attacked the steel works of Ruhrstahl, which made steel used in the production of aircraft, tanks and other armaments. In the attack, nine Lancasters were lost and the steel works were missed by bombs. Of these, 195 Sqn lost four Lancasters: HK697 ‘A4-C‘; NG351 ‘JE-E‘; PB112 ‘JE-H‘ and PB196 ‘JE-D‘. One crew survived a crash landing, two other crewmen were taken prisoner but the remainder were all killed – a terrible night for Bomber Command and for 195 Sqn in particular. As the war neared its conclusion further raids were carried out, losses fell as defences weakened, a mix of both day and night sorties saw operations to Munich, Duisburg, Dortmund, Dresden and once again Berlin. 195 Sqn’s last operational bombing sortie took place on April 24th 1945, following which they took part in Operation ‘Manna‘, dropping food supplies to the starving Dutch people. After this, 195 Sqn began the operations to bring home the many POWs in Operation ‘Exodus’, a task they took great pride in. On May 7th 1945, the last flight took place from Wratting Common and the squadron was disbanded on August 14th. No longer required, Wratting Common airfield was closed, and within eight months its hangar doors were shut for the final time, the site then returned to agriculture a state in which it survives in today. One of the few permanent buildings left on the technical site. Wratting Common was a short-lived airfield, its crews took part in many of Bomber Command’s most fierce-some air battles, losing a large number of men in the process. Whilst not the enormous toll we’ve come to expect from bomber squadrons, it none the less suffered the terrible injustices of war, and the loss of life that scarred so many families for so long. Long may they be remembered. The efforts of the many Bomber Command crews were never forgotten though, and land owned by the Vestey family was donated for a memorial that was organised through the efforts of numerous people. Some of the original buildings have been refurbished and are now used by the local farm, several of the hangars remain also in use by local companies, by using them they are at least preserving them. If approaching from the Haverhill direction, the first structures you see are the two hangers, a T2 and a B1, either side of the road. The B1 to your left and the T2 to your right, both linked across the road by a former track and dispersal point. There would have been four spectacle dispersal points here, all now removed. 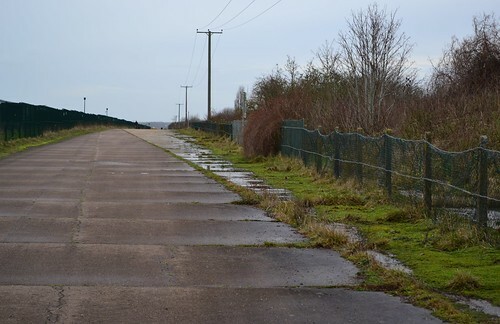 A footpath near to this point does cross part of the airfield site, allowing some access to remnants of the perimeter tracks. Continue along this road and then turn right, you will then come across Weston Woods Farm. 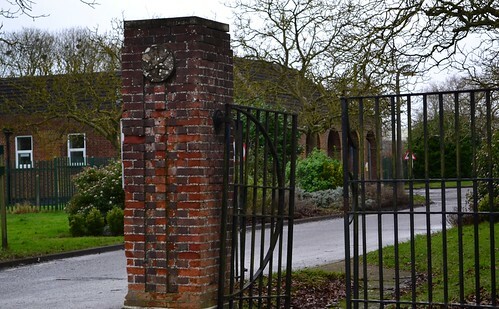 This is the former entrance to the airfield site and here stands the memorial and a number of buildings owned by the farm. In the distance, you can see a further T2, and a small group of Nissen huts again owned by the farm. This area was once the technical area, stores, Motor Transport huts and a range of technical buildings were plentiful in the late 1940s. Now reduced to nothing more than a handful, they are reminders of the days when the RAF’s heavy bombers graced the site. A short distance along the road from here was the operations block (now gone) and turning left at the junction, the first of the domestic sites – Site 7. The road between here and the nearby village of Weston Colville are where the majority of these site stood, the basic concrete entrances being the only significant indication of anything being here. The village sign at Weston Colville displays a Stirling indicating its links to the airfield and the domestic sites that once stood on this ground. With little of this site remaining, a handful of buildings, the memorial and a well designed information board, keep the history of those young men who flew from here in the few short years of its existence alive, their stories shall live on as will the memories of the fight they took deep into the heart of the Nazi homeland. From Wratting Common we head south again, turning back on our tracks and returning toward Haverhill. From here we continue on with our trail around Britain’s airfields and back once more into the counties of Suffolk and Essex. 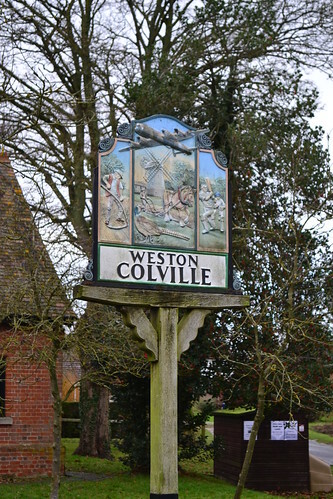 Weston Colville village sign depicts its links with Wratting Common, the village being home to the many domestic sites of the airfield. Sources, notes and further Reading. *1 Chorley., W. R., “Bomber Command Losses 1943“, Midland Counties Publications, 1996. A book of remembrance is thought to be in St Mary’s Church, West Wickham. Sadly on the day I visited, the church was unusually locked. A website dedicated to those who flew from Wratting Common has a lot of additional information and photographs, it is certainly worth a visit. In the second part of RAF Stradishall, we carry on from part 1, looking at the terrible circumstances around 214 Squadron’s worst night. The developments of Stradishall in the later war years and the post war development with the arrival of the Cold War and the jet age. However, of the fourteen 214 Sqn Wellingtons that left, seven were lost and a further Wellington was hit in both engines by light flak the pilot nursing it back to England. Of those seven lost, one airman, Sgt. C. Davidson was taken prisoner of war, four have no known grave and the remaining thirty-seven all died, and remain buried in graves across Belgium and Germany. Truly a terrible night for 214 Sqn. 57 Squadron fared little better, losing five aircraft with the deaths of twenty-five airmen, the remaining five being taken prisoner. Further losses that month were restricted to just odd aircraft with the last loss being recorded on the night of 28th/29th April, with all crewmen being lost. Before the month would be out, 214 would begin the conversion to Stirlings, a new start and a new challenge. The Stirling would prove to be a robust but under performing aircraft, its short wingspan and subsequent lack of lift, proving to be its biggest downfall. 214 Sqn would, during the conversion programme, write off nine aircraft, much of this though being as a result of operational activity, some however, due to pilot error or accidents. The first incident occurring on May 5th, 1942, approximately one week into the programme, when Stirling N6092 piloted by F/O. Gasper and Sgt. 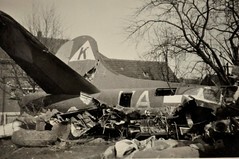 M Savage, swung on take off resulting in its undercarriage collapsing. In the October 1942, 214 Sqn would leave for the final time, moving off to Stradishall’s satellite airfield, RAF Chedburgh, where they remained until December 1943. Following this they transferred to RAF Downham Market. The last loss of a 214 aircraft at Stradishall being on the night of September 19th/20th with the loss of Stirling ‘BU-U’ R9356 along with four of the seven crew, the remaining three being taken prisoners. By the end of 1942, 214 Sqn would have lost thirty-three Stirlings, twice that of the Wellington, all-in-all a huge loss of life. Former Married quarters are now private dwellings, but still retain that feel they had when they were first built. The December of 1944 not only saw the departure, for the last time, of the Stirling as a heavy bomber, but it heralded the arrival of the Lancaster, the remarkable four-engined bomber that became the backbone of Bomber Command. In total 7,377 of the bombers were produced, including 430 that were constructed in Canada. A remarkable aircraft born out of the much under-powered and disliked Avro Manchester, it went on to fly over 156,000 sorties, dropping over 50 million incendiary bombs and over 608,000 tons of HE bombs. 186 Sqn would be the first unit here with the Lancaster both the MK.I and the MK.III, operating them in a number of missions over occupied Europe. One of the saddest ends to the war and the operations of 186 Squadron was on the night of April 134th/14th. Whilst returning from bombing the U-boat yards at Kiel, two Lancasters: P8483 ‘X’ and P8488 ‘J’ collided at 02:26. Five of the crew from AP-X were killed, either instantly or as a result of injuries sustained, whilst all seven of AP-J lost their lives. This loss would account for a high proportion of the squadron’s losses, 186 Sqn only losing nine Lancasters in the six months of residency – a considerable change to the carnage suffered at Stradishall earlier on in the war. 186 Sqn would finally be disbanded here in July 1945. Over the next four years, there would be a return of both the Stirling and the Lancaster, but this time in the transport role, as Stradishall was passed over to Transport Command. No. 51 Sqn, and No. 158 Sqn both flying Stirlings (158 Sqn being disbanded at Stradishall) 35 Sqn, 115 Sqn, 149 Sqn and 207 Sqn all operating various models of the Lancaster until February 1949. There would then be a lull in operations at Stradishall between April and July 1949 whilst the airfield was put into care and maintenance. Following this 203 Advanced Flying School (AFS) moved in with a range of aircraft types, including the Meteor and the Vampire. Also thrown into the mix were a number of piston engined aircraft, notably the Spitfire XIV, XVI and XVIII, along with Tempests, Beaufighters and Mosquito T3s. Other training aircraft also came along covering everything from the Tiger Moth to the modern jet fighter. A new age was dawning. On the night of August 31st and September 1st 1949, 203 AFS and 226 Operational Conversion Unit (OCU) at Driffield, would both disband and reopen under each other’s titles, the new 226 OCU now operating as the training unit converting pilots to jet aircraft. To the left was the main airfield now covered by a solar farm, to the right would have been the hangars, the original apron concrete still visible. The post war years of the 1950s would see Stradishall thrown back into front line operations once more, this time there would be no heavy bombers though, but there would be plenty of front line fighters. First along were the night fighter variants of the Meteor (NF.11) and Venom (NF.3) between March 1955 and March 1957, a residency for a reformed 125 Squadron that coincided with 245 Squadron only 3 months behind them. No. 245 swapping the Meteor for the Hunter before being disbanded in June that year. No. 89 Squadron (another unit reformed in December 1955) saw the arrival of the new delta wing Javelins FAW6 & FAW2 working alongside the ageing Venom Night Fighters. They flew these aircraft for thirteen months before being disbanded once more, and then renamed as 85 Squadron whilst here at Stradishall. After this re-branding they continued to fly the Javelins. In 1959 they too departed Stradishall for RAF West Malling and then onto RAF West Raynham, where they too disbanded once more. 1957 saw more of the same, 152 Squadron yo-yoing between Stradishall and Wattisham, finally disbanding here in July 1958 with 263 Squadron following a similar pattern, also disbanding here in the same month with their Hunter F.6s. In July 1958, No. 1 Squadron were yet another unit to reform here, carrying on from where 263 Sqn left off. After replacing the F.6s of 263 Sqn with FGA.9s in the fighter / strike role, they finally departed to Waterbeach, eventually becoming a front line Harrier unit at Cottesmore. Gradually operations at Stradishall were beginning to wind down. In June 1959 No. 54 Squadron also replaced the Hunter F.6s with FGA.9s before they too departed for Waterbeach in Cambridgeshire. 54 Sqn went on to fly both the Phantom and the Jaguar as front line operational units, all iconic aircraft of the Cold War. A very short spell by three Hunter squadrons led to the eventual closure of Stradishall in 1960 as a front line fighter station; 208, 111 and 43 Sqns all playing a minor part in the final operations at this famous airfield. The last flying unit No.1 Air Navigation School (ANS) finally closing the station doors as they too disbanded on August 26th 1970, being absorbed by No. 6 Flying Training School. Some older buildings can still be found outside the grounds of the Prison. A considerable number of non-operational units would also operate from Stradishall throughout its operational life such as 21 Blind Approach Training Flight, meaning just short of 50 flying units would use the facilities at Stradishall, all helping to train and prepare aircrews for the RAF and the defence of Britain. Stradishall’s long and distinguished aviation history finally came to a close when it was sold off and handed over to HM Prison Service, becoming as it is today, HMP Highpoint Prison (North) and HMP Highpoint Prison (South). A rather ungainly ending to a remarkably historic airfield. Stradishall is located a few miles south-west of Chedburgh, the main A143 dissects the two prison blocks, the north side being the former accommodation area, with the south block being the technical area and main airfield site. 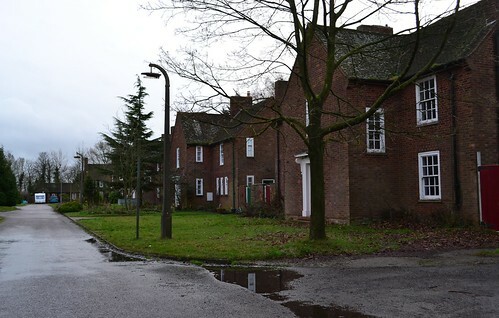 Access to the site is therefore limited, however, the former officers mess and associated buildings are available to view, as are a number of former technical buildings. 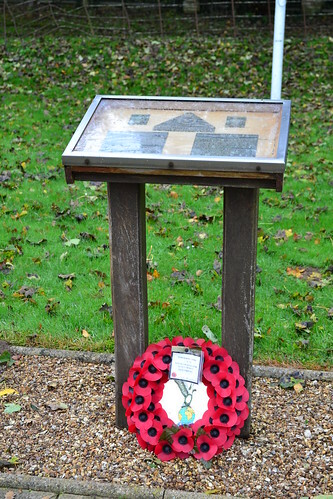 A large memorial is currently displayed outside the officer’s mess building, named Stirling House in memory of the aircraft type that flew from here, and it is open to the public. The foyer of the building, now a Prison Officer Training facility, is opened, and holds a roll of Honour, for those lost at the airfield. 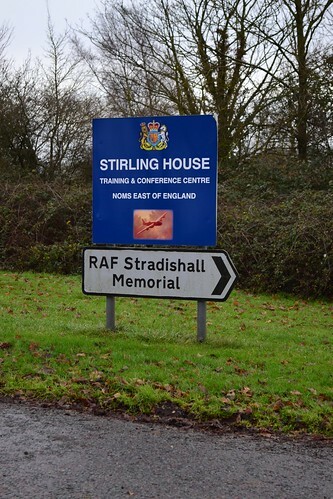 The current Prison Officers Training facility is named after the ill-fated Stirling that flew from RAF Stradishall. The Memorial being well sign posted. 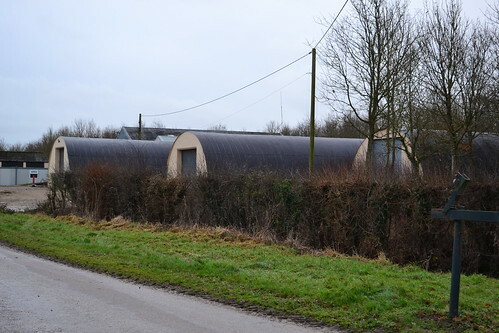 Through the high security fencing, and around the site a number of buildings can still be seen, the familiar layout and design being standard of wartime and post war airfields. By turning off the A143 prior to reaching the memorial site, a small back access road allows public access to the airfield site. This is now, in part, a conservation area where the runways have all been removed, parts of the perimeter track do still remain and public access is permitted. The runways have been replaced by a solar farm, large panels cover the entire area and all are encased in high security fencing with closed circuit TV preventing you from wandering too close to the high-tech plant. Walking along the northern side of the airfield, views can be seen of the accommodation area, again a number of former buildings can be seen through the fencing, their style typical of the expansion period design. 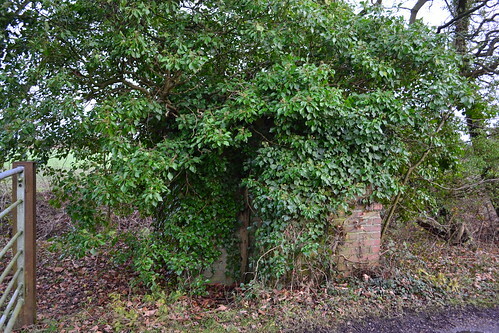 The dilapidated gateway hides many original buildings and a layout that reflects airfield design of the expansion period. Back on the main road, turning left passing the prison, a turn off gives access to the aforementioned officers mess and memorial, it is well signposted, and continuing on, brings you to the former married quarters, now private housing, again typical of airfield design. Across the road from here, a farm track still has a small number of buildings now in a very poor state, this would have been an entrance to the accommodation area behind the current north side Prison. They are both quite well hidden by undergrowth but they are visible with a little effort. Stradishall, like many of the early expansion period airfields, with its neo-Georgian style architecture and well designed layout, lasted well into the cold war period. These early examples which set the standard for future designs, proved to be long-lasting and robust, unlike many of their later counterparts hastily built with temporary accommodation. Whilst a rather unfitting end to a long and distinguished life, the transformation into a prison has in part, been its saviour, and one that has preserved many of its fine buildings for the foreseeable future at least. *1 419 (Special Duties) Flight were initially formed at North Weald on 21st August 1940, being disbanded and re designated 1419 (Special Duties ) Flight on 1st March 1941 at Stradishall. They in turn were disbanded on 25th August 1941 to be reformed at Newmarket as 138 Sqn. they moved back to Stradishall on 16th December 1941. In February 1942, the nucleus of 138 Sqn formed 161 Sqn at Newmarket continuing the role of SOE operations from there. *3 ORB 214 Sqn: AIR\27\1321\8 National Archives. 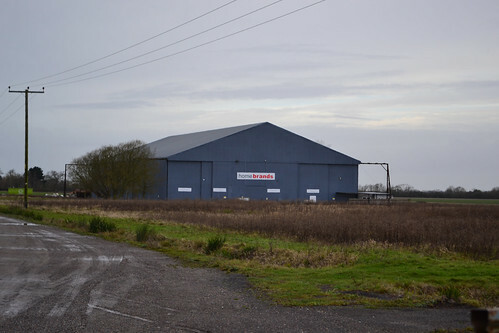 RAF Downham Market was one of a small number of airfields that were home to the RAF’s Pathfinder Squadrons. Elite airmen who would lead formations of heavy bombers into some of the most heavily defended areas of the Reich, often against insurmountable odds and always at great risk to themselves. The Pathfinders produced some remarkable flyers and many, many heroes. Of all the crews who flew with 8 Group PFF, only three were rewarded for their valour and gallantry with the highest possible accolade, the Victoria Cross. One of those went Posthumously to Sqn. Ldr. I. W. Bazalgette, whose long and distinguished career led him to achieving 58 missions before his death. Based at RAF Downham Market, Bazalgette, would become legendary, flying his Lancaster bomber in pursuit of victory against a tyranny beyond all evil. Squadron Leader Ian Willoughby “Baz” Bazalgette was born on October 19th 1918 in Calgary, Canada and was the youngest of three children. His parents decided to move to England in 1924 when he was six, settling in New Malden, Surrey on the outskirts of London. During his school life he developed a passion for music, and in particular Classical Music, which he immersed himself in spending hours listening to and writing about. As a teenager, he would have his first real battle, that of tuberculosis, which meant he would have to undergo four long months of hospital treatment. Bazalgette’s strength and determination would see him pull though this, a strength and determination that would go on to show itself on a number of occasions later on during his RAF career. Prior to the outbreak of war, Bazalgette decided to enlist, applying to, and being accepted by, the Royal Artillery; achieving a commission as Second Lieutenant within a year. This new role took him to the outskirts of Edinburgh operating a radar searchlight, protecting both the city, and the Forth Estuary from Luftwaffe bombers. Dissatisfied with the routine of searchlight activities, he decided to give up this role, and whilst on a trip into nearby Edinburgh in March 1941, he applied to the Royal Air Force Volunteer Reserves. 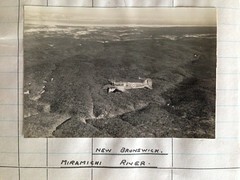 His application was accepted and in the following July, he received his first posting to a training unit – 22 Elementary Flying Training School at Cambridge. Throughout his training Bazalgette showed great tenacity and promise, quickly passing a number of stringent and difficult flying tests. Flying solo for the first time during August, gave him the opportunity he had been longing for. His flying skills impressed his seniors so much that on the 28th, he passed the C.O.s test taking just 30 minutes to complete the flight. Upon passing, he was graded as an ‘above average’ pilot by his examiners. Bazalgette was then transferred to Cranwell where he trained on Airspeed Oxfords. At Cranwell he achieved his wings, and after a short break, he was sent to Scampton and 18 Beam Approach School. Bazalgette eventually left Scampton, heading towards his first operational unit, 25 Operational Training Unit, where he would form his first crew. Informal crewing up was very much encouraged by the RAF, but those that didn’t manage the task were allocated crew members by the relevant staff at the various bases; Bazalgette had no problems in finding his own. Whilst at the OTU, Bazalgette would have his first experience of heavy bombers flying the Vickers Wellington; a remarkable aircraft that used Barnes Wallis’ geodesic construction in Rex Pierson’s design. Bazalgette and his crew competed a range of training flights whilst at 25 OTU, including air gunnery and bombing practice, all of which they passed. On September 18th 1942, after accumulating some 223 hours as a pilot, Bazalgette received his first posting to a fully operational Squadron, 115 Squadron at RAF Marham, Norfolk, he was off to war. The very next day he flew “Second Dickie” assisting an experienced crew tackling the rigours of an operational sortie to Saarbrucken. Two days later he was back out, but this time laying mines on a ‘Gardening’ mission shortly before the squadron moved to nearby RAF Mildenhall in Suffolk. It was here that Bazalgette would fly his first operational mission as a pilot leading his own crew. After moving to East Wretham, 115 squadron then began the task of replacing their Wellingtons with Stirlings, and Bazalgette was sent to 1567 Operational Conversion Unit (OCU) to convert to the big heavy four-engined aircraft. Between him completing the course and returning to East Wretham though the Stirling had been superseded, proving to be a poor performer in conflict zones. Bazalgette would now get his chance to fly the legendary Lancaster. On the 3rd April 1943, Bazalgette was awarded the DFC, and the same strength and determination that had got him though tuberculosis would get him through his tour of 30 missions. On completion, as was customary at this point, he and his crew were separated and scattered across a range of new squadrons within the Air Force. Bazalgette was sent back to Scotland and RAF Lossiemouth where he reluctantly trained new bomber pilots, a position he disliked immensely. He pleaded for postings to an operational unit, a plea that was eventually granted in April 1944, and a posting to RAF Warboys and the Pathfinder Conversion Unit. From here he transferred with a new crew to 635 Squadron at RAF Downham Market, in Norfolk, a few miles west of Marham the very station he had spent his early days at with 115 Sqn. As a model crew, he was looked up to by others at Downham Market. He would go on to fly 58 missions in total, two off his score of two tours of duty. However, his 58th mission would be his last. On August 4th 1944, Lancaster ‘M’ for Mother would not be listed for duty, but an absent crew left an opening that Bazalgette and his crew jumped at. It was a decision that would change their lives forever. On that day, Bazalgette would fly Lancaster Mk III, F2-‘T’ for Tommy, not their usual aircraft but it was ready, fuelled and bombed up. The aircraft was known for a history of mechanical problems, its usual pilot tending to work the engines much harder than necessary, but it was a choice of stay on the ground or fly the mission: for Bazalgette and the crew of ‘M’ for Mother it was an easy choice. The mission for the day was as Master Bomber of the Pathfinder squadron to identify and mark a V1 storage site at Trossy St. Maximin, a heavily defended area to the north of Paris. 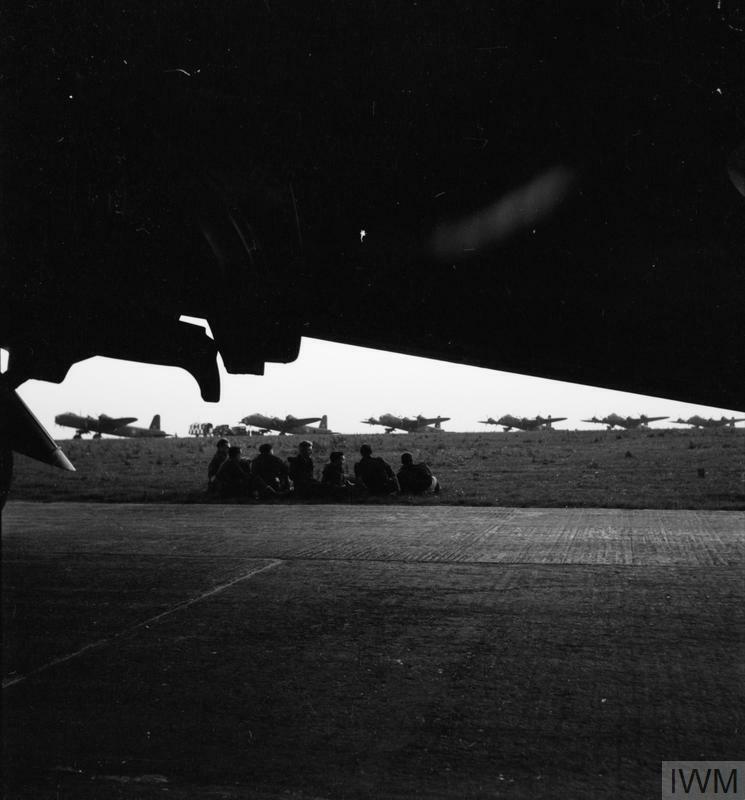 Take off was set for 11:00, over the next fifteen minutes at five-minute intervals, 14 Lancasters of 635 Sqn would leave Downham Market heading for France. The weather was less than 3/10 cloud over the target, excellent for the determined and accurate anti-aircraft gunners below. On the second run in to the target, the Master Bomber and Deputy Master bomber were both hit, one being downed (PA983 F2-A piloted by F/L. R. W. Beveridge) and the second forced to return home, leaving Bazalgette as the lead aircraft. Flak was incredibly intense and his aircraft repeatedly hit. The starboard wing was struck causing damage to both engines, subsequently putting them both out of action. In the wing the fuel tanks caught fire, fuel poured into the rear of the fuselage and the situation becomes desperate. The bomb aimer was mortally wounded, his arm barely recognisable due to his injuries, but Bazalgette managed to reach the target, drop both his markers and his bombs, whereupon the aircraft began a steep spin toward the ground below. As the situation worsened, he gave the order to bail out, all but three; Bazalgette, F/Lt. I. A. Hibbert and F/Sgt. V. V. R. Leader are left. Bazalgette continued to fight with the controls and quite remarkably managed to keep the stricken bomber flying long enough to avoid the French village of Senantes. Unable to maintain height, the aircraft finally hit the ground, resting momentarily before exploding in a massive fireball killing all those remaining on board. Once the ferocious fire subsided, locals were able to reach the wreck and remove the bodies of both Leeder and Hibbert. Bazalgette’s remains were not found until the air frame was removed, some days later. On 4th August 1944 Squadron Leader Bazalgette was “Master bomber” of a Pathfinder Squadron detailed to mark an important target for the main bomber force. When nearing the target his Lancaster was seriously damaged and set on fire by anti-aircraft fire; the bomb aimer was badly wounded. As the deputy “Master bomber” had already been shot down, the success of the attack depended on Squadron Leader Bazalgette who despite appalling conditions in his burning aircraft pressed on gallantly, bombed, and marked the target accurately. That the attack was successful was due to his magnificent effort. The condition of the aircraft had by now become so bad that Squadron Leader Bazalgette ordered his crew to leave the aircraft by parachute. He attempted the almost hopeless task of landing the crippled and blazing aircraft to save the wounded bomb aimer, and one air-gunner, who had been overcome by fumes. With superb skill and taking great care to avoid a French village, be brought the aircraft safely down. Unfortunately it then exploded and this gallant officer and his two comrades perished. His heroic sacrifice marked the climax of a long career of operations against the enemy. He always chose the more dangerous and exacting roles. His courage and devotion to duty were beyond praise. Ian Bazalgette’s sacrifice marked the end of a career covering an incredible 58 operational missions. His courage, determination and devotion to duty going way beyond those expected of any serving officer. With him that day on ‘T’ for Tommy were: Sgt. G. R. Turner; F/L. G. Goddard; F/L. I. 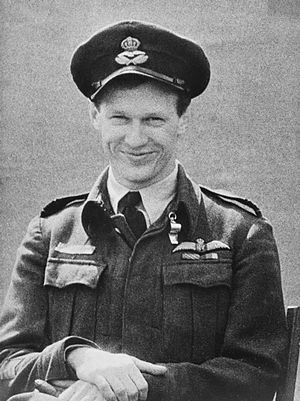 A. Hibbert DFC; F/O. C. R. Godfrey DFC; F/S. V. V. R. Leeder (RAAF) and F/O. D. Cameron DFM. Of the four men who manged to get out of the aircraft: Turner, Goddard, Godfrey and Cameron, all managed to evade capture*2. In his honour, Bazalgette has a Garden in New Malden, Surrey named after him, a school in Calgary, the ‘Ian Bazalgette Junior High School’, and at the Bomber Command Museum of Canada, an Avro Lancaster, FM159, was painted in the markings of his aircraft; the Lancaster was dedicated in 1990. At the ceremony, Bazalgette’s sister, Mrs. E. Broderick, unveiled a commemorative plaque whilst the aircraft itself was unveiled by two of Bazalgette’s former crew members, Chuck Godfrey DFC and George Turner, both of whom were with him of that fateful night. Outside the church of St. Mary’s at Bexwell close to the accommodation sites of Downham airfield, stands a small memorial in his name. Laying beside him is the memorial of another V.C. winner Arthur Aaron, who was also based at RAF Downham Market during the Second World War. Ian Bazalgette was one of those many young men who sacrificed their lives in the hope of saving others. He dedication to duty, determination to win and above all, his value of other’s led to a tragic and sad end, that shall forever be remembered in the hearts and minds of those who lived through those terrible years 1939-45. 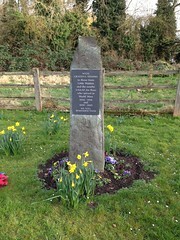 The memorial at St. Mary’s Church Bexwell. RAF Downham Market appears in Trail 7: Northwest Norfolk. There is a book written listing every operation of 635 Sqn whilst at RAF Downham Market, with crew details, aircraft profiles and mission aerial photographs. It is an amazing record and the result of three years work. The author Christopher Coverdale, is also on the committee aiming to construct the new memorial at RAF Downham Market. The Bomber Command Museum of Canada website has a detailed account of the restoration of Lancaster FM159. *1 Photo IWM – CH 15911 in the public domain. Other records of heroism and crew stories can be found on the Heroic Tales page.